The Korea Herald is publishing a series of interviews on promising startups in the financial technology industry. This is the 23rd installment. -- Ed. 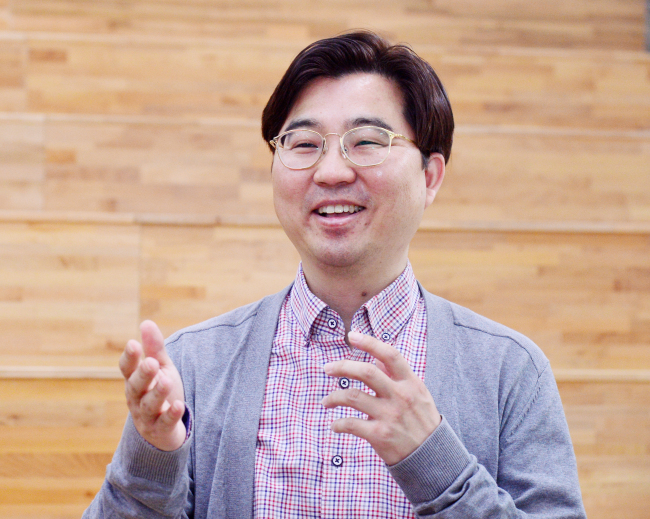 For about a decade before Chung Woo-young founded mobile biometrics developer startup Winningi in 2015, he was a forensic technician who worked for the National Police Agency in South Korea. He was engaged in the nation’s project to collect and manage some 56 million fingerprint records of residents in the nation with a population of 51.2 million. The state-led project to establish a homegrown automated fingerprint identification system was designed to help police investigate the identity of unknown people who are found dead, and keep track of criminals and other suspicious persons. He joined the project as a systems integrator. Now the 47-year-old marches on to his fresh career path as a chief executive of Winningi, a financial startup that provides contactless palmprint recognition technology to financial institutions. 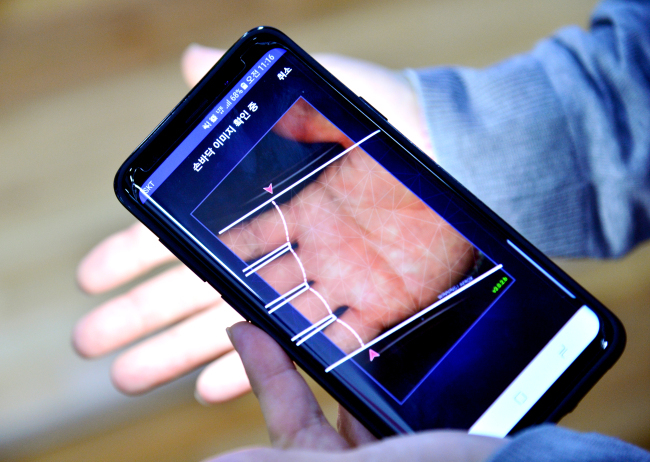 Launched in December 2017, the biometric authentication system using palmprint scanner software first commercialized in May 2018 through a partnership with Jeonbuk Bank, a provincial bank based in Jeonju, North Jeolla Province. Information related to palmprint is managed and protected under the authority of Korea’s interbank clearing house, the Korea Financial Telecommunications & Clearings Institute. The KFTC has authorized 75 financial institutions here to make use of biometrics information about fingerprints, eye iris and face. To verify a bank account for a financial service like withdrawal or money transfer, he or she will locate his or her palm to a palm-shaped contour that is displayed on the mobile phone screen through the rear camera. When the software that works with a banking app scans the palm’s texture, indents and other marks, the rear camera’s LED flash automatically comes on, so that the rear camera lens facing the palm has enough light to operate. Within seconds, the palmprint scanner software will compare the new information with the user’s biometric information that is already stored for verification. The technology works on mobile banking networks, distinguishing itself from palm-vein authentication technology that works solely on offline devices like automated teller machines. Also, the technology runs on not only the top-tier smartphones but also budget phones with a resolution of at least 8 megapixels. Chung said its biometric authentication technology can be an option to financial institutions that are seeking an alternative to fingerprint readers. For example, Apple’s iPhone X device does not allow fingerprint recognition, meaning a financial institution had to come up with an alternative to fingerprint-based authentication for iPhone X users. When smartphone maker Samsung Electronics decided to halt production of fire-prone Samsung Galaxy Note 7, financial institutions scrambled to look for an alternative to its iris scanning function, because the Samsung Galaxy Note 7 was the only smartphone that enabled iris scanning. Chung also claimed the biometric technology can ward off cybersecurity threats through techniques such as data masking and decentralization of biometric information. The next goal of the startup, comprising Chung and three employees including technicians, is to enter Southeast Asian markets in Indonesia and Vietnam, Chung said.